The finite element method (FEM), is a numerical method for solving problems of engineering and mathematical physics. Typical problem areas of interest include structural analysis, heat transfer, fluid flow, mass transport, and electromagnetic potential. The analytical solution of these problems generally require the solution to boundary value problems for partial differential equations. The finite element method formulation of the problem results in a system of algebraic equations. The method approximates the unknown function over the domain. To solve the problem, it subdivides a large system into smaller, simpler parts that are called finite elements. The simple equations that model these finite elements are then assembled into a larger system of equations that models the entire problem. FEM then uses variational methods from the calculus of variations to approximate a solution by minimizing an associated error function. The finite element method obtained its real impetus in the 1960s and 1970s by the developments of J. H. Argyris with co-workers at the University of Stuttgart, R. W. Clough with co-workers at UC Berkeley, O. C. Zienkiewicz with co-workers Ernest Hinton, Bruce Irons and others at the University of Swansea, Philippe G. Ciarlet at the University of Paris 6 and Richard Gallagher with co-workers at Cornell University. Further impetus was provided in these years by available open source finite element software programs. NASA sponsored the original version of NASTRAN, and UC Berkeley made the finite element program SAP IV widely available. In Norway the ship classification society Det Norske Veritas (now DNV GL) developed Sesam in 1969 for use in analysis of ships. A rigorous mathematical basis to the finite element method was provided in 1973 with the publication by Strang and Fix. The method has since been generalized for the numerical modeling of physical systems in a wide variety of engineering disciplines, e.g., electromagnetism, heat transfer, and fluid dynamics.
. For this reason, we will develop the finite element method for P1 and outline its generalization to P2. 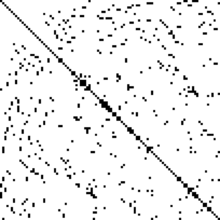 (mean value theorem), but may be proved in a distributional sense as well. (see Sobolev spaces). Existence and uniqueness of the solution can also be shown. to be a space of piecewise polynomial functions. and one can use this derivative for the purpose of integration by parts. would consist of functions that are linear on each triangle of the chosen triangulation. in the literature. Since we do not perform such an analysis, we will not use this notation. in the disk centered at the origin and radius 1, with zero boundary conditions. , which we need to invert, are zero. is symmetric and positive definite, so a technique such as the conjugate gradient method is favored. For problems that are not too large, sparse LU decompositions and Cholesky decompositions still work well. 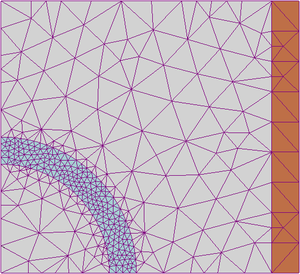 For instance, MATLAB's backslash operator (which uses sparse LU, sparse Cholesky, and other factorization methods) can be sufficient for meshes with a hundred thousand vertices. is dubbed the mass matrix.
. 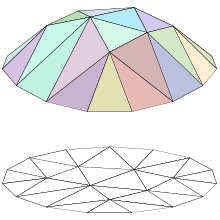 In the preceding treatment, the grid consisted of triangles, but one can also use squares or curvilinear polygons. FEM allows detailed visualization of where structures bend or twist, and indicates the distribution of stresses and displacements. FEM software provides a wide range of simulation options for controlling the complexity of both modeling and analysis of a system. Similarly, the desired level of accuracy required and associated computational time requirements can be managed simultaneously to address most engineering applications. FEM allows entire designs to be constructed, refined, and optimized before the design is manufactured. The mesh is an integral part of the model and it must be controlled carefully to give the best results. 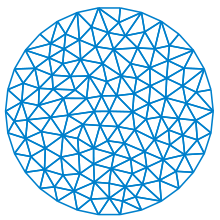 Generally the higher the number of elements in a mesh, the more accurate the solution of the discretised problem. However, there is a value at which the results converge and further mesh refinement does not increase accuracy. ^ Daryl L. Logan (2011). A first course in the finite element method. Cengage Learning. ISBN 978-0495668251. ^ Reddy, J. N. (2006). An Introduction to the Finite Element Method (Third ed.). McGraw-Hill. ISBN 9780071267618. ^ "Finite Elements Analysis (FEA)". www.manortool.com. Retrieved 2017-07-28. ^ Hrennikoff, Alexander (1941). "Solution of problems of elasticity by the framework method". Journal of Applied Mechanics. 8.4: 169–175. ^ Courant, R. (1943). "Variational methods for the solution of problems of equilibrium and vibrations". Bulletin of the American Mathematical Society. 49: 1–23. doi:10.1090/s0002-9904-1943-07818-4. ^ "СПб ЭМИ РАН". emi.nw.ru. Retrieved 17 March 2018. ^ Hinton, Ernest; Irons, Bruce (July 1968). "Least squares smoothing of experimental data using finite elements". Strain. 4 (3): 24–27. doi:10.1111/j.1475-1305.1968.tb01368.x. ^ "SAP-IV Software and Manuals". NISEE e-Library, The Earthquake Engineering Online Archive. ^ Gard Paulsen; Håkon With Andersen; John Petter Collett; Iver Tangen Stensrud (2014). Building Trust, The history of DNV 1864-2014. Lysaker, Norway: Dinamo Forlag A/S. pp. 121, 436. ISBN 978-82-8071-256-1. ^ Strang, Gilbert; Fix, George (1973). An Analysis of The Finite Element Method. Prentice Hall. ISBN 978-0-13-032946-2. ^ Zienkiewicz, O.C. ; Taylor, R.L. ; Zhu, J.Z. (2005). The Finite Element Method: Its Basis and Fundamentals (Sixth ed.). Butterworth-Heinemann. ISBN 978-0750663205. ^ Bathe, K.J. (2006). Finite Element Procedures. Cambridge, MA: Klaus-Jürgen Bathe. ISBN 978-0979004902. ^ Smith, I.M. ; Griffiths, D.V. ; Margetts, L. (2014). Programming the Finite Element Method (Fifth ed.). Wiley. ISBN 978-1-119-97334-8. ^ Babuška, Ivo; Banerjee, Uday; Osborn, John E. (June 2004). "Generalized Finite Element Methods: Main Ideas, Results, and Perspective". International Journal of Computational Methods. 1 (1): 67–103. doi:10.1142/S0219876204000083. ^ Song, Chongmin; Wolf, John P. (5 August 1997). "The scaled boundary finite-element method - alias consistent infinitesimal finite-element cell method - for elastodynamics". Computer Methods in Applied Mechanics and Engineering. 147 (3–4): 329–355. Bibcode:1997CMAME.147..329S. doi:10.1016/S0045-7825(97)00021-2. ^ "Spectral Element Methods". State Key Laboratory of Scientific and Engineering Computing. Retrieved 2017-07-28. ^ "What's The Difference Between FEM, FDM, and FVM?". Machine Design. 2016-04-18. Retrieved 2017-07-28. ^ Kiritsis, D.; Eemmanouilidis, Ch. ; Koronios, A.; Mathew, J. (2009). "Engineering Asset Management". Proceedings of the 4th World Congress on Engineering Asset Management (WCEAM): 591–592. 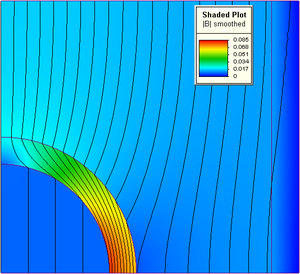 ^ "Finite Element Analysis: How to create a great model". Coventive Composites. 2019-03-18. Retrieved 2019-04-05. ^ Naghibi Beidokhti, Hamid; Janssen, Dennis; Khoshgoftar, Mehdi; Sprengers, Andre; Perdahcioglu, Emin Semih; Boogaard, Ton Van den; Verdonschot, Nico (2016). "A comparison between dynamic implicit and explicit finite element simulations of the native knee joint". Medical Engineering & Physics. 38 (10): 1123–1130. doi:10.1016/j.medengphy.2016.06.001. PMID 27349493. ^ a b c Hastings, J. K., Juds, M. A., Brauer, J. R., Accuracy and Economy of Finite Element Magnetic Analysis, 33rd Annual National Relay Conference, April 1985. ^ McLaren-Mercedes (2006). "McLaren Mercedes: Feature - Stress to impress". Archived from the original on 2006-10-30. Retrieved 2006-10-03. ^ Peng Long; Wang Jinliang; Zhu Qiding (19 May 1995). "Methods with high accuracy for finite element probability computing". Journal of Computational and Applied Mathematics. 59 (2): 181–189. doi:10.1016/0377-0427(94)00027-X. ^ Haldar, Achintya; Mahadevan, Sankaran (2000). Reliability Assessment Using Stochastic Finite Element Analysis. John Wiley & Sons. ISBN 978-0471369615. ^ Arregui Mena, J.D. ; Margetts, L.; et al. (2014). "Practical Application of the Stochastic Finite Element Method". Archives of Computational Methods in Engineering. 23 (1): 171–190. doi:10.1007/s11831-014-9139-3. 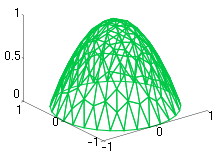 Wikimedia Commons has media related to Finite element modelling.